To understand how options work, one must understand how greeks work. Greeks determine how sensitive option value is to changes in independent variables. It is not easy to remember all the greeks calculations and numbers in our head but a simple picture can say more than thousand numbers! 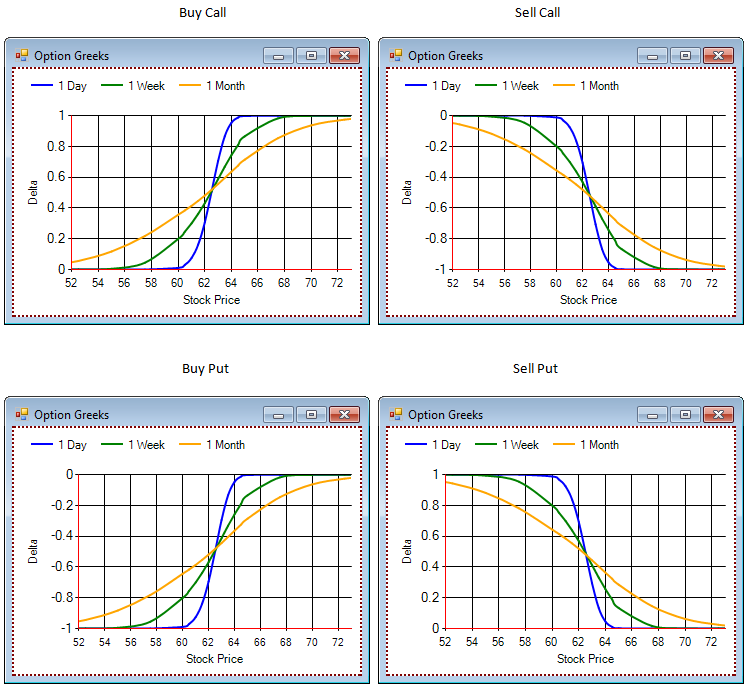 These inputs affect option price and interact with each other. Naturally, it would not be so easy to take into account all the changes in the same time as well as their dependency on each other. It is easier to assume that these inputs are independent and to look at each one by one to get the idea of how they may affect option price and how to take advantage of them. In order to manage risks in plain vanilla options it is enough to take into account Delta, Gamma, Vega and Theta greeks to approximate the value change of an option. Strike=62.50, today =01 Sep 2012, dividends=0, risk free rate = 0.275%. All other parameters are given in the code I provide below. 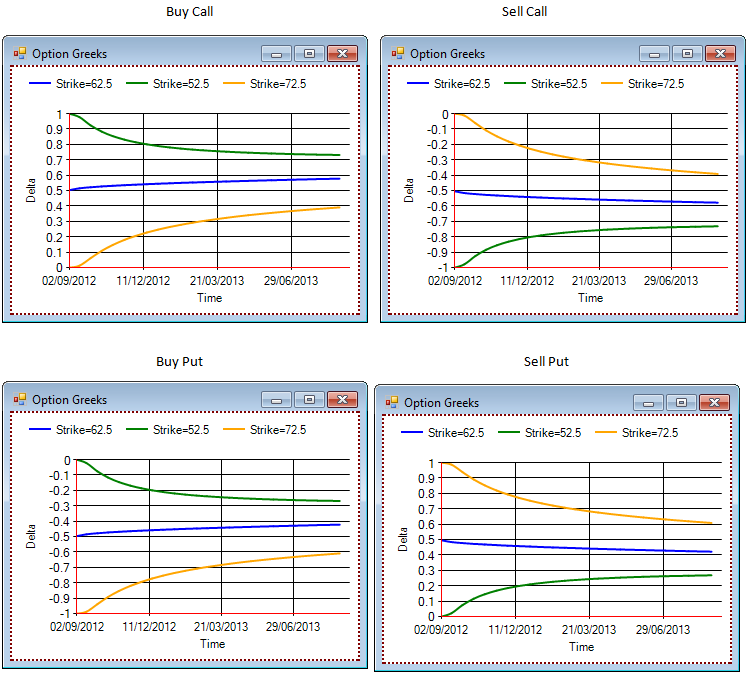 Delta measures the rate of change of an option for a 1 unit move of an underlying stock. Usually, one unit move can be $1 or 1%. It is said, Delta is the first partial derivative of an option with respect to the price of the underlying stock. As for me, I define delta as the equivalent of underlying stocks. Traders sometimes say it is a probability to expire ITM. •Buy Call/Sell Put: delta is always positive ranging from 0 to 1, ATM (strike 62.5) has 0.5 delta. •Sell Call/Buy Put: delta is always negative ranging from 0 to -1. ATM (strike 62.5) has -0.5 delta. •The closer to expiration, the more disparate delta is, i.e. short term option react more than long term option to the same underlying price change. •From the pictures above it is clear that probability to be ITM or ATM at expiration change as maturity approaches. •Buy Call: as maturity approaches, Call option with the strike 52.5 has more chances to expire ITM because the underlying has less time to move below strike. Call option with the strike 72.5 has more chances to expire OTM because the underlying has less time to move above strike. The same logic is applicable to Put option. Quantlib code is published in the Part 2 .